The President, in the name of Congress, has awarded more than 3,400 Medals of Honor to our nation's bravest Soldiers, Sailors, Airmen, Marines, and Coast Guardsmen since the decoration's creation in 1861. For years, the citations highlighting these acts of bravery and heroism resided in dusty archives and only sporadically were printed. In 1973, the U.S. Senate ordered the citations compiled and printed as Committee on Veterans' Affairs, U.S. Senate, Medal of Honor Recipients: 1863-1973 (Washington, D.C.: Government Printing Office, 1973). This book was later updated and reprinted in 1979. Last Names starting with "A" and "B"
Last Names starting with "C" and "D"
Last Names starting with "E" "F" "G"
Last Names starting with "J" "K" "L"
Last Names starting with "M" and "N"
Last Names starting with "O" to "R"
Last Names starting with "S" to "Z"
Rank and organization: Private, Company B, 47th Ohio Infantry. Place and date: At Vicksburg, Miss., 3 May 1863. Entered service at: Adrian, Mich. Birth: 1843, Germany. Date of issue: 3 January 1907. Citation: Was one of a party which volunteered and attempted to run the enemy's batteries with a steam tug and 2 barges loaded with subsistence stores. Rank and organization: Sergeant, Company F, 5th Vermont Infantry. Place and date: At Petersburg, Va., 2 April 1865. Entered service at: Salisbury, Vt. Born: 18 January 1841, Bolton, N.Y. Date of issue: 10 May 1865. Citation: Capture of flag of 23d Tennessee Infantry (C.S.A.) with several of the enemy. Rank and organization: Sergeant, Company F, 9th Michigan Cavalry. Place and date: At siege of Knoxville, Tenn., 20 November 1863. Entered service at: Adrian, Mich. Born: 27 April 1838, Sandy Creek, Oswego County, N.Y. Date of issue: 5 April 1898. Citation: With one companion, voluntarily carried through the enemy's lines important dispatches from Gen. Grant to Gen. Burnside, then besieged within Knoxville, and brought back replies, his comrade's horse being killed and the man taken prisoner. Rank and organization: Corporal, Company E, 6th New Hampshire Veteran Infantry. Place and date: Near Pegram House, Va., 30 September 1864. Entered service at: ------. Birth: Nashua, N.H. Date of issue: 27 July 1896. Citation: As color bearer of his regiment he defended his colors with great personal gallantry and brought them safely out of the action. Rank and organization: Quarter Gunner, U.S. Navy. Born: 1832, Philadelphia, Pa. Accredited to: Pennsylvania. G.O. No. : 59, 22 June 1865. Citation: Haffee served on board the U.S.S. New Ironsides during action in several attacks on Fort Fisher, 24 and 25 December 1864; and 13, 14, and 15 January 1865. The ship steamed in and took the lead in the ironclad division close inshore, and immediately opened its starboard battery in a barrage of well-directed fire to cause several fires and explosions and dismount several guns during the first 2 days of fighting. Taken under fire, as she steamed into position on 13 January, the New Ironsides fought all day and took on ammunition at night despite severe weather conditions. When the enemy came out of his bombproof to defend the fort against the storming party, the ship's battery disabled nearly every gun on the fort facing the shore before the cease-fire orders were given by the flagship. Rank and organization: Private, Company A, 61st New York Infantry. Place and date: At Sailors Creek, Va., 6 April 1865. Entered service at:------. Birth: Canada, Date of issue: 10 May 1865. Citation: Capture of flag. Rank and organization: Sergeant, Company G, 72d New York Infantry. Place and date: At Williamsburg, Va., 5 May 1862. At Bristol Station, Va., 27 August 1862. At Manassas, Va., 29-30 August 1862. Entered service at: Westfield, N.Y. Born: 1 July 1841, Westfield, N.Y. Date of issue: 8 June 1888. Citation: At Williamsburg, Va., voluntarily carried a severely wounded comrade off the field in the face of a large force of the enemy; in doing so was himself severely wounded and taken prisoner. Went into the fight at Bristol Station, Va., although severely disabled. At Manassas, volunteered to search the woods for the wounded. Rank and organization: Corporal, Company E, 1st Michigan Sharpshooters. Place and dare: At Petersburg, Va., 30 July 1864. Entered service at: Goodland, Mich. Born. 1846, Reading, Mich. Date of issue. 31 July 1896. Citation: Instead of retreating, remained in the captured works, regardless of his personal safety and exposed to the firing, which he boldly and deliberately returned until the enemy was close upon him. Rank and organization. Captain of the Forecastle, U.S. Navy. Born: 1824, Ireland. Accredited to. Ohio. G.O. No. : 45, 31 December 1864. Citation: Served as captain of the forecastle on board the U.S.S. Kearsarge when she destroyed the Alabama off Cherbourg, France, 19 June 1864. Acting as captain of a gun during the bitter engagement, Haley exhibited marked coolness and good conduct and was highly commended by his division officer for his gallantry and meritorious achievement under enemy fire. Rank and organization: Chaplain, 16th New York Infantry. Place and date: At Salem Heights, Va., 3 May 1863. Entered service at: Plattsburgh, N.Y. Birth: ------. Date of issue: 16 February 1897. Citation: Voluntarily exposed himself to a heavy fire during the thickest of the fight and carried wounded men to the rear for treatment and attendance. Rank and organization: Second Lieutenant, Company G, 27th New York Infantry; and Captain, Company F, 121st New York Infantry. Place and date. At Gaines Mill, Va., 27 June 1862. At Rappallannock Station, Va., 7 November 1863. Entered service at: New York. Birth: New York. Date of issue: 17 August 1891. Citation: Although wounded at Gaines Mill, Va., he remained on duty and participated in the battle with his company. At Rappahannock Station, Va., while acting as aide, rendered gallant and prompt assistance in reforming the regiments inside the enemy's works. Rank and organization: Corporal, Company I, 104th Ohio Infantry. Place and date: At Franklin, Tenn., 30 November 1864. Entered service at: ------. Birth: Portage County, Ohio. Date of issue: 13 February 1865. Citation: Capture of flag, believed to have belonged to Steward's Corps (C.S.A.). Rank and organization: Private, Company K, 124th New York Infantry. Place and date: At Bristoe Station, Va., 15 June 1863. Entered service at: Middletown, N.Y. Birth: Orange County, N.Y. Date of issue: 10 September 1897. Citation: At imminent peril saved from death or capture a disabled officer of his company by carrying him under a hot musketry fire, to a place of safety. Rank and organization: Coxswain, U.S. Navy. Born: 1837, New York. Accredited to: New York. G.O. No. : 45, 31 December 1864. Citation: On board the U.S.S. Brooklyn during action against rebel forts and gunboats and with the ram Tennessee, in Mobile Bay, 5 August 1864. Despite severe damage to his ship and the loss of several men on board as enemy fire raked her decks from stem to stern, Halstead fought his gun with skill and courage throughout the furious battle which resulted in the surrender of the prize rebel ram Tennessee and in the damaging and destruction of batteries at Fort Morgan. Rank and organization: Carpenter's Mate, U.S. Navy. Born: 1820, Portsmouth, N.H. Accredited to: New Hampshire. G.O. No. : 45, 31 December 1864. Citation: Served on board the U.S.S. Kearsarge when she destroyed the Alabama off Cherbourg, France, 19 June 1864. Performing his duties intelligently and faithfully, Ham distinguished himself in the face of the bitter enemy fire and was highly commended by his divisional officer. Rank and organization: Coxswain, U.S. Navy. Born: 1830, New York, N.Y. Accredited to: New York. G.O. No. : 45, 31 December 1864. Citation: On board the U.S.S. Richmond during action against rebel forts and gunboats and with the ram Tennessee in Mobile Bay, 5 August 1864. Despite damage to his ship and the loss of several men on board as enemy fire raked her decks, Hamilton performed his duties with skill and courage throughout the prolonged battle which resulted in the surrender of the rebel ram Tennessee and in the successful attacks carried out on Fort Morgan. Rank and organization: Coal Heaver, U.S. Navy. Born: 1836, Philadelphia, Pa. Accredited to: Pennsylvania G.O. No. : 45, 31 December 1864. Citation: Hamilton served on board the U.S. Picket Boat No. 1, in action, 27 October 1864, against the Confederate ram Albemarle which had resisted repeated attacks by our steamers and had kept a large force of vessels employed in watching her. The picket boat, equipped with a spar torpedo, succeeded in passing the enemy pickets within 20 yards without being discovered and then made for the Albemarle under a full head of steam. Immediately taken under fire by the ram, the small boat plunged on, jumped the log boom which encircled the target and exploded its torpedo under the port bow of the ram. The picket boat was destroyed by enemy fire and almost the entire crew taken prisoner or lost. Rank and organization: Sergeant, Battery A, 1st Missouri Light Artillery. Place and date: At Grand Gulf, Miss., 28-29 April 1863. Entered service at: St. Louis, Mo. Birth: Germany. Date of issue: 10 March 1896. Citation: With two comrades voluntarily took position on board the steamer Cheeseman, in charge of all the guns and ammunition of the battery, and remained in charge of the same for considerable time while the steamer was unmanageable and subjected to a heavy fire from the enemy. Rank and organization: Quartermaster, U.S. Navy. Born: 1836, Delaware. Accredited to: Delaware. G.O. No. : 11 , 3 April 1 863. Citation: Served on board the U.S.S. Ceres in the fight near Hamilton, Roanoke River, 9 July 1862. Fired on by the enemy with small arms, Hand courageously returned the raking enemy fire and was spoken of for "good conduct and cool bravery under enemy fire," by the commanding officer. Rank and organization: Chaplain, 55th Illinois Infantry. Place and date: At Atlanta, Ga., 22 July 1864. Entered service at: Bushnell, Ill. Birth: Ohio. Date of issue: 3 November 1896. Citation: Voluntarily carried a musket in the ranks of his regiment and rendered heroic service in retaking the Federal works which had been captured by the enemy. Rank and organization: Private, Company H, 2d U.S. Cavalry. Place and date: At Woodstock, Va., 9 October 1864. Entered service at: ------. Birth: Allegany County, N.Y. Date of issue: 14 October 1864. Citation: Capture of flag of 32d Battalion Virginia Cavalry (C.S.A.). Rank and organization: Private, Company E, 37th Ohio Infantry. Place and date: At Vicksburg Miss., 22 May 1863. Entered service at: Chillicothe, Ohio. Birth: Chillicothe, Ohio. Date of issue: 19 November 1897. Citation: Voluntarily and under fire went to the rescue of a wounded comrade Iying between the lines, gave him water, and brought him off the field. Rank and organization: Sergeant, Company B, 50th Massachusetts Infantry. Place and date: At Port Hudson, La., 4 July 1863. Entered service at: Rockport, Mass. Born: 3 November 1842, Bristol, Maine. Date of issue: 2 November 1895. Citation: Voluntarily exposed himself to a heavy fire to get water for comrades in rifle pits. Rank and organization: Corporal, Company H, 2d Minnesota Infantry. Place and date: At Nolensville, Tenn., 15 February 1863. Entered service at: Henderson, Minn. Birth: Lickland County, Ohio. Date of issue: 11 September 1897. Citation: Was one of a detachment of 16 men who heroically defended a wagon train against the attack of 125 cavalry, repulsed the attack and saved the train. Rank and organization: Corporal, Company F, 19th Maine Infantry. Place and date: At Bristoe Station, Va., 14 October 1863. Entered service at: Bowdoinham, Maine. Birth: Danville, Maine. Date of issue: 1 December 1864. Citation: Capture of the flag of 26th North Carolina (C.S.A.). Rank and organization: Lieutenant Colonel, 104th Illinois Infantry. Place and date: At Peach Tree Creek, Ga., 20 July 1864. Entered service at: Ottawa, Ill. Born: 15 January 1839, Ephratah, Fulton County, N.Y. Date of issue: 5 April 1898. Citation: With conspicuous coolness and bravery rallied his men under a severe attack, re-formed the broken ranks, and repulsed the attack. Rank and organization: Private, Company K, 29th Massachusetts Infantry. Place and date: At Petersburg, Va., 17 June 1864. Entered service at: Boston, Mass. Born: 9 September 1840, England. Date of issue: 24 February 1897. Citation: Capture of flag along with 3 enemy men. Rank and organization: Ordinary Seaman, U.S. Navy. Born: 1841, Boston, Mass. Accredited to: Massachusetts. G.O. No. : 59, 22 June 1865. Citation: On board the U.S.S. Minnesota in action during the assault on Fort Fisher, 15 January 1865. Landing on the beach with the assaulting party from his ship, Harcourt advanced to the top of the sandhill and partly through the breach in the palisades despite enemy fire which killed and wounded many officers and men. When more than two-thirds of the men become seized with panic and retreated on the run, he remained with the party until dark when it came safely away, bringing its wounded, its arms and its colors. Rank and organization: Private, Company G, 39th Illinois Infantry. Place and date: At Deep Run, Va., 16 August 1864. Entered service at: Bremen, Ill. Birth: Noble County, Ind. Date of issue: 6 April 1865. Citation. Capture of flag. He was wounded in the shoulder during this action. He was killed in action at Petersburg on 28 August 1864. Rank and organization: Captain of the Forecastle, U.S. Navy. Born: 1837, Middletown, Conn. Accredited to: Connecticut. G.O. No. : 45, 31 December 1864. Citation: Served as captain of the forecastle on board the U.S.S. Dacotah on the occasion of the destruction of the blockade runner Pevensey, near Beauford, N.C., 9 June 1864. "Learning that one of the officers in the boat, which was in danger of being, and subsequently was, swamped, could not swim, Harding remarked to him: 'If we are swamped, sir, I shall carry you to the beach or I will never go there myself.' He did not succeed in carrying out his promise, but made desperate efforts to do so, while others thought only of themselves. Such conduct is worthy of appreciation and admiration--a sailor risking his own life to save that of an officer." Rank and organization: First Lieutenant, Company G, 132d New York Infantry. Place and date: At Bachelors Creek, N.C., 1 February 1864. Entered service at: New York, N.Y., Birth: New York, N.Y. Date of issue: 28 June 1890. Citation: With a command of 11 men, on picket, resisted the attack of an overwhelming force of the enemy. Rank and organization: Ordinary Seaman, U.S. Navy. Born: 1842, Brooklyn, N.Y. Accredited to: New York. G.O. No. : 45, 31 December 1864. Citation: Harley served on board the U.S. Picket Boat No. 1, in action, 27 October 1864, against the Confederate ram Albemarle, which had resisted repeated attacks by our steamers and had kept a large force of vessels employed in watching her. The picket boat, equipped with a spar torpedo, succeeded in passing the enemy pickets within 20 yards without being discovered and then made for the Albemarle under a full head of steam. Immediately taken under fire by the ram, the small boat plunged on, jumped the log boom which encircled the target and exploded its torpedo under the port bow of the ram. The picket boat was destroyed by enemy fire and almost the entire crew taken prisoner or lost. Rank and organization: Corporal, Company K, 211th Pennsylvania Infantry. Place and date: At Petersburg, Va., 2 April 1865. Entered service at: ------. Birth: Westmoreland County, Pa. Date of issue: 20 May 1865. Citation: Capture of flag. Rank and organization: Landsman, U.S. Navy. Born: 1849, Ireland. Accredited to: Massachusetts. G.O. No. : 11 , 3 April 1863. Citation: Harrington, a landsman from the U.S.S. Pocahontas, participated in a shore mission to procure meat for the ship's crew. While returning to the beach, the party was fired on from ambush and several men killed or wounded. Cool and courageous throughout his action, Harrington rendered gallant service against the enemy and in administering to the casualties. Rank and organization: Sergeant, Company G, 2d Vermont Infantry. Place and date: At Fredericksburg, Va., 3 May 1863. Entered service at: Kirby, Vt. Birth: Waterford, Maine. Date of issue: 13 December 1893. Citation: Carried the colors to the top of the heights and almost to the muzzle of the enemy's guns. Rank and organization: Private, Company B, 148th Pennsylvania Infantry. Place and date: At Spotsylvania, Va., 12 May 1864. Entered service at: Bellefonte, Pa. Birth: Schuylkill, Pa. Date of issue: 1 December 1864. Citation: Capture of flag, wresting it from the color bearer and shooting an officer who attempted to regain it. Rank and organization: Sergeant, Company B, 38th U.S. Colored Troops. Place and date: At New Market Heights, Va., 29 September 1864. Entered service at:------. Birth: St. Marys County, Md. Date of issue: 18 February 1874. Citation: Gallantry in the assault. Rank and organization: First Lieutenant, 1st U.S. Cavalry. Place and date: At Smithfield, Va., 28 August 1864. Entered service at: New Hampshire. Birth: Andover, N.H. Date of issue: 23 January 1896. Citation: In an attack upon a largely superior force, his personal gallantry was so conspicuous as to inspire the men to extraordinary efforts, resulting in complete rout of the enemy. Rank and organization: Private, Company K, 30th Ohio Infantry. Place and date: At Vicksburg, Miss., 22 May 1863. Entered service at: Olive, Ohio. Birth: Noble County, Ohio. Date of issue: 10 July 1894. Citation: Gallantry in the charge of the "volunteer storming party." Rank and organization: Seaman, U.S. Navy. Born: 1842, Massachusetts. Accredited to: Massachusetts. G.O. No. 45, 31 December 1864. Citation: Served on board the U.S.S. Kearsarge when she destroyed the Alabama off Cherbourg, France, 19 June 1864. Acting as sponger and loader of the 11-inch pivot gun during the bitter engagement, Harrison exhibited marked coolness and good conduct and was highly recommended for his gallantry under fire by the divisional officer. Rank and organization: Sergeant, Company D, 6th Pennsylvania Reserves. Place and date: At Gettysburg, Pa., 2 July 1863. Entered service at: Cumberland, Md. Birth: Germany. Date of issue: 3 August 1897. Citation: Was one of six volunteers who charged upon a log house near the Devil's Den, where a squad of the enemy's sharpshooters were sheltered, and compelled their surrender. Rank and organization: Private, Company B, 8th New York Cavalry. Place and date: At Shenandoah Valley, Va., 1864 and 1865. Entered service at: Pittsford, N.Y. Birth: Rushville, N.Y. Date of issue: 3 July 1872. Citation: Gallant conduct and services as scout in connection with capture of the guerrilla Harry Gilmore, and other daring acts. Rank and organization: Colonel, 4th Pennsylvania Militia. Place and date: At Bull Run, Va., 21 July 1861. Entered service at: Norristown, Pa. Born: 16 December 1830, New Hanover Township, Montgomery County, Pa. Date of issue: 26 August 1886. Citation: Voluntarily served as an aide and participated in the battle after expiration of his term of service, distinguishing himself in rallying several regiments which had been thrown into confusion. Rank and organization: Corporal, Company A, 22d New York Cavalry. Place and date: At Waynesboro, Va., 2 March 1865. Entered service at: Rochester, N.Y. Birth: England. Date of issue: 26 March 1865. Citation: Capture of flag and bearer, with two other prisoners. Rank and organization: Sergeant Major, 3d Maine Infantry. Place and date: At Fair Oaks, Va., 1 June 1862. Entered service at: Waterville, Maine. Born: 1843, Benton, Maine. Date of issue: 8 December 1898. Citation: Assumed command of a portion of the left wing of his regiment, all the company officers present having been killed or disabled, led it gallantly across a stream and contributed most effectively to the success of the action. Rank and organization: Sergeant, Company C, 35th Massachusetts Infantry. Place and date: At Antietam, Md., 17 September 1862. Entered service at: Chelsea, Mass. Birth: Chelsea, Mass. Date of issue: 18 November 1896. Citation: Although wounded and exposed to a heavy fire from the enemy, at the risk of his own life he rescued a badly wounded comrade and succeeded in conveying him to a place of safety. Rank and organization: Captain, Company M, 5th Michigan Cavalry. Place and date: At Newbys Crossroads, Va., 24 July 1863. Entered service at: ------. Birth: Quincy, Mich. Date of issue: 2 August 1897. Citation: While in command of a squadron in rear guard of a cavalry division, then retiring before the advance of a corps of infantry, was attacked by the enemy and, orders having been given to abandon the guns of a section of field artillery with the rear guard that were in imminent danger of capture, he disregarded the orders received and aided in repelling the attack and saving the guns. Rank and organization: Brigadier General, U.S. Volunteers. Place and date: At South Mountain, Md., 14 September 1862. Entered service at: New York, N.Y. Born: 9 January 1822, Oswego, N.Y. Date of issue: 28 October 1893. 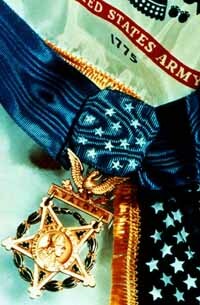 Citation: Was severely wounded while leading one of his brigades in the attack under a heavy fire from the enemy. Rank and organization: Seaman, U.S. Navy. Entered service at: Plymouth, Mass. Born: 9 July 1838, Plymouth, Mass. Citation: On board the U.S.S. Sciota prior to the battle Vicksburg, on 28 June 1862. Struck by a bullet which severed his left arm above the elbow, Hathaway displayed exceptional courage as his ship sustained numerous damaging hits from stem to stern while proceeding down the river to fight the battle of Vicksburg. Rank and organization: Sergeant, Company G, 1st Rhode Island Light Artillery. Place and date: At Petersburg, Va., 2 April 1865. Entered service at: Providence, R.I. Birth: Ireland. Date of issue: 16 June 1866. Citation: Was one of a detachment of 20 picket artillerymen who voluntarily accompanied an infantry assaulting party and who turned upon the enemy the guns captured in the assault. Rank and organization: First Lieutenant, Company E, 3d Vermont Infantry. Place and date: At Petersburg, Va., 2 April 1865. Entered service at: Woodstock, Vt. Birth: Pomfret, Vt. Date of issue: 30 September 1893. Citation: When the lines were wavering from the well-directed fire of the enemy, this officer, acting adjutant of the regiment, sprang forward, and with encouraging words cheered the soldiers on and, although dangerously wounded, refused to leave the field until the enemy's works were taken. Rank and organization: Corporal, Company A, 33d Ohio Infantry. Place and date: Georgia, April 1862. Entered service at: Portsmouth, Scioto County, Ohio. Birth: Mercer County, Pa. Date of issue: September 1863. Citation: One of the 19 of 22 men (including 2 civilians) who, by direction of Gen. Mitchell (or Buell), penetrated nearly 200 miles south into enemy territory and captured a railroad train at Big Shanty, Ga., in an attempt to destroy the bridges and track between Chattanooga and Atlanta. Rank and organization: Sergeant Major, 6th U.S. Colored Troops. Place and date: At Chapins Farm, Va., 29 September 1864. Entered service at: Philadelphia, Pa. Birth: Cincinnati, Ohio. Date of issue: 8 February 1870. Citation: Rescue of regimental colors. Rank and organization: Corporal, Company F, 121st New York Infantry. Place and date: At Sailors Creek, Va., 6 April 1865. Entered service at: Otsego, N.Y. Born: 1832, Salem, N.Y. Date of issue: 29 December 1894. Citation: Captured the Confederate Gen. G. W. Custis Lee. Rank and organization: Quartermaster, U.S. Navy. Born: 1834, Maryland. Accredited to: Maryland. G.O. No. : 59, 22 June 1865. Citation: On board the U.S.S. Ticonderoga, as quartermaster in charge of steering the ship into action, during attacks on Fort Fisher, 13 to 15 January 1865. Hayden steered the ship into position in the line of battle where she maintained a well-directed fire upon the batteries to the left of the palisades during the initial phases of the engagement. Although several of the enemy's shots fell over and around the vessel, the Ticonderoga fought her guns gallantly throughout 3 consecutive days of battle until the flag was planted on one of the strongest fortifications possessed by the rebels. Rank and organization: Coxswain, U.S. Navy. Born: 1831, Philadelphia, Pa. Accredited to: Pennsylvania. G.O. No. : 45, 31 December 1864. Citation: Served on board the U.S.S. Kearsarge when she destroyed the Alabama off Cherbourg, France, 19 June 1864. Acting as second captain of the No. 2 gun during this bitter engagement, Hayes exhibited marked coolness and good conduct and was highly recommended for his gallantry under fire by the divisional officer. Rank and organization: Coxswain, U.S. Navy. Born: 1840, Rhode Island. Accredited to: Rhode Island. G.O. No. : 45, 31 December 1864. Citation: As Captain of No. 1 gun on board the U.S.S. Richmond during action against rebel forts and gunboats and with the ram Tennessee in Mobile Bay, 5 August 1864. Cool and courageous at his station throughout the prolonged action, Hayes maintained fire from his gun on Fort Morgan and on ships of the Confederacy despite extremely heavy return fire. Rank and organization: Corporal, Company F, 17th Maine Infantry. Place and date: At Sailors Creek, Va., 6 April 1865. Entered service at: Maine. Birth: Edinburgh, Maine. Date of issue: 10 May 1865. Citation: Capture of flag. Rank and organization: Private, Company F, 4th Iowa Cavalry. Place and date: At Columbus, Ga., 16 April 1865. Entered service at: Oskaloosa, Mahaska County, Iowa. Birth: Jefferson County, Ohio. Date of issue: 17 June 1865. Citation: Capture of flag and bearer Austin's Battery (C.S.A.). Rank and organization: Private, Company E, 5th Iowa Cavalry. Place and date: At Newnan, Ga., 29 July 1864. Entered service at: Dubuque, Iowa. Birth: Dubuque, Iowa. Date of issue: 13 January 1899. Citation: When nearly surrounded by the enemy, captured a Confederate soldier, and with the aid of a comrade who joined him later, captured 4 other Confederate soldiers, disarmed the 5 prisoners, and brought them all into the Union lines. Rank and organization: First Lieutenant, 4th U.S. Cavalry. Place and date: Near Harpeth River, Tenn., 17 December 1864. Entered service at: Ohio. Birth: Ohio. Date of issue: 5 April 1898. Citation: At the head of his regiment charged a field battery with strong infantry supports, broke the enemy's line and, with other mounted troops, captured 3 guns and many prisoners. Rank and organization: Captain, Company C, 6th New York Cavalry Place and date: At Chancellorsville, Va., 30 April 1863. Entered service at: Kinderhook, N.Y. Born: 28 February 1837, Kinderhook, N Y. Date of issue: 30 March 1898. Citation: Took command of the regiment as its senior officer when surrounded by Stuart's Cavalry. The regiment cut its way through the enemy's line and escaped but Capt. Heermance was desperately wounded, left for dead on the field and was taken prisoner. Rank and organization: Sergeant, Company A, 66th Ohio Infantry. Place and date: At Chancellorsville, Va., 2 May 1863. Entered service at: Urbana, Ohio. Birth:------. Date of issue: 29 July 1892. Citation: One of a party of 4 who, under heavy fire, voluntarily brought into the Union lines a wounded Confederate officer from whom was obtained valuable information concerning the position of the enemy. Rank and organization: Private, Company B, 83d Indiana Infantry. Place and date: At Vicksburg, Miss., 22 May 1863. Entered service at: Farmers Retreat, Ind. Birth: Dearborn, Ind. Date of issue: 26 July 1894. Citation: Gallantry in the charge of the "volunteer storming party." Rank and organization: Colonel, 40th Massachusetts Infantry. Place and date: At Cold Harbor, Va., 1 June 1864. Entered service at: Reading Pa. Birth: Fort Smith, Indian Ter. Date of issue: 5 December 1893. Citation: Led the assaults of his brigade upon the enemy's works, where he had 2 horses shot under him. Rank and organization: Sergeant, Company B, 113th Illinois Infantry. Place and date: At Vicksburg, Miss., 22 May 1863. Entered service at: Kankakee, Ill. Birth: Sunfish, Ohio. Date of issue: 9 July 1894. Citation: Gallantry in the charge of the "volunteer storming party." Rank and organization: Colonel, 10th Vermont Infantry. Place and date: At Cedar Creek, Va., 19 October 1864. Entered service at: Waterbury, Vt. Born: 21 November 1831, Waterbury, Vt. Date of issue: 21 December 1892. Citation: Though suffering from severe wounds, rejoined his regiment and let it in a brilliant charge, recapturing the guns of an abandoned battery. Rank and organization: Private, Company E, 11th Iowa Infantry. Place and date: Near Kenesaw Mountain, Ga., 15 June 1864. Entered service at: Tipton, Cedar County, Iowa. Born: 1840, Michigan. Date of issue: 27 November 1899. Citation: With one companion and under a fierce fire of the enemy at close range, went to the rescue of a wounded comrade who had fallen between the lines and carried him to a place of safety. Rank and organization: Lieutenant Colonel, 9th Iowa Infantry. Place and date: At Pea Ridge, Ark., 7 May 1862. Entered service at: Pittsburgh, Pa. Born: 17 February 1837, Pittsburgh, Pa. Date of issue 26 September 1893. Citation: Was foremost in leading his men, rallying them to repeated acts of daring, until himself disabled and taken prisoner. Rank and organization: Colonel, 13th Maine Infantry. Place and date: At Matagorda Bay, Tex., 29-30 December 1863. Entered service at: Maine. Born: 10 December 1833, Bangor, Maine. Date of issue: 2 March 1895. Citation: In command of a detachment of 100 men, conducted a reconnaissance for 2 days, baffling and beating back an attacking force of more than a thousand Confederate cavalry, and regained his transport without loss. Rank and organization: Private, Company C, 48th New York Infantry. Place and date: Near Fort Wagner, S.C., 13 July 1863, Near Fort Wagner, S.C., 14 July 1863; Near Fort Wagner, S.C., 18 July 1863. Entered service at: New York, N.Y. Birth: England. Date of issue: 23 October 1897. Citation: While voluntarily performing picket duty under fire on 13 July 1863, was attacked and his surrender demanded, but he killed his assailant. The day following responded to a call for a volunteer to reconnoiter the enemy's position, and went within the enemy's lines under fire and was exposed to great danger. On 18 July voluntarily exposed himself with great gallantry during an assault, and received 3 wounds that permanently disabled him for active service. Rank and organization: Sergeant, Company E, 2d New York Cavalry. Place and date: At Stony Creek Bridge, Va., 29 June 1864. Entered service at:------. Birth: Troy, N.Y. Date of issue: 18 April 1891. Citation: With a detachment of 3 men, tore up the bridge at Stony Creek being the last man on the bridge and covering the retreat until he was shot down. Rank and organization: Second Class Fireman, U.S. Navy. Born: 1837, Richmond, Va. Accredited to: Virginia. G.O. No. : 17, 10 July 1863. Citation: Served on board the U.S.S. Richmond in the attack on Port Hudson, 14 March 1863. Damaged by a 6-inch solid rifle shot which shattered the starboard safety-valve chamber and also damaged the port safety-valve, the fireroom of the U.S.S. Richmond immediately became filled with steam to place it in an extremely critical condition. Acting courageously in this crisis, Hickman persisted in penetrating the steam-filled room in order to haul the hot fires of the furnaces and continued this action until the gravity of the situation had been lessened. Rank and organization: Corporal, Company A, 8th Connecticut Infantry. Place and date: At Chapins Farm, Va., 29 September 1864. Entered service at: Danbury, Conn. Birth: Danbury, Conn. Date of issue: 6 April 1865. Citation: Capture of flag. Rank and organization: Private, Company F, 1st Pennsylvania Cavalry. Place and date: At Appomattox Campaign, Va., 29 March to 9 April 1865. Entered service at: New Brighton, Pa. Birth: Pittsburgh, Pa. Date of issue: 3 May 1865. Citation: Capture of flag. Rank and organization: Sergeant, Company D, 99th Illinois Infantry. Place and date: At Vicksburg, Miss., 22 May 1863. Entered service at: Barry, Pike County, Ill. Birth: Canada. Date of issue: 1 April 1898. Citation: When his regiment fell back in the assault, repulsed, this soldier continued to advance and planted the flag on the parapet, where he was captured by the enemy. Rank and organization: Corporal, Company D, 23d Illinois Infantry. Place and date: At Petersburg, Va., 2 April 1865. Entered service at: Chicago, Ill. Birth: Ireland. Date of issue: 12 May 1865. Citation: Conspicuous gallantry as color bearer in the assault on Fort Gregg. Rank and organization: Captain, Company K, 1 6th Michigan Infantry. Place and date: At Cold Harbor, Va., 1 June 1864. Entered service at: Detroit, Mich. Birth: Liberty, N.Y. Date of issue: 4 December 1893. Citation: Led the brigade skirmish line in a desperate charge on the enemy's masked batteries to the muzzles of the guns, where he was severely wounded. Rank and organization: Corporal, Company C, 50th Pennsylvania Infantry. Place and date: At Wilderness, Va., 6 May 1864. Entered service at: -----. Birth: Schuylkill County, Pa. Date of issue: 23 September 1897. Citation: This soldier, with one companion, would not retire when his regiment fell back in confusion after an unsuccessful charge, but instead advanced and continued firing upon the enemy until the regiment re-formed and regained its position. Rank and organization: First Lieutenant, Company I, 21st Iowa Infantry. Place and date: At Champion Hill, Miss., 16 May 1863. Entered service at: Cascade, Iowa. Birth: England. Date of issue: 15 March 1893. Citation: By skillful and brave management captured 3 of the enemy's pickets. Rank and organization: Sergeant, Company C, 14th New York Heavy Artillery. Place and date: At Petersburg, Va., 30 July 1864. Entered service at: Lyons, N.Y. Birth. Lyons, N.Y. Date of issue: 1 December 1864. Citation: Capture of flag, shooting a Confederate officer who was rallying his men with the colors in his hand. Rank and organization: Musician, Company A, 8th Wisconsin Infantry. Place and date: At Mechanicsburg, Miss., 4 June 1863. Entered service at. Waupaca Township, Wis. Born: 23 May 1843, Golden, Erie County, N.Y. Date of issue: 17 December 1897. Citation: When men were needed to oppose a superior Confederate force he laid down his drum for a rifle and proceeded to the front of the skirmish line which was about 120 feet from the enemy. While on this volunteer mission and firing at the enemy he was hit in the head with a minie ball which passed through him. An order was given to "lay him in the shade; he won't last long." He recovered from this wound being left with an ugly scar. Rank and organization: Private, Company E, 9th New York Cavalry. Place and date: At North Fork, Va., 26 September 1864. Entered service at. ------. Birth: 26 June 1841, Conewango, N.Y. Date of issue: 26 September 1893. citation: Voluntarily carried a severely wounded comrade out of a heavy fire of the enemy. Rank and organization: Sergeant, Company H, 4th U.S. Colored Troops. Place and date. At Chapins Farm, Va., 29 September 1864. Entered service at:------. Birth: Harford County, Md. Date of issue: 6 April 1865. Citation: When the regimental color bearer fell, this soldier seized the color and carried it forward, together with the national standard, until disabled at the enemy's inner line. Rank and organization: Sergeant Major, 14th Connecticut Infantry. Place and date: At Gettysburg, Pa., 3 July 1863. Entered service at: Bridgeport, Conn. Birth: Bucksport, Me. Date of issue: 1 December 1864. Citation: During the highwater mark of Pickett's charge on 3 July 1863 the colors of the 14th Tenn. Inf. C.S.A. were planted 50 yards in front of the center of Sgt. Maj. Hincks' regiment. There were no Confederates standing near it but several were Iying down around it. Upon a call for volunteers by Maj. Ellis, commanding, to capture this flag, this soldier and 2 others leaped the wall. One companion was instantly shot. Sgt. Maj. Hincks outran his remaining companion running straight and swift for the colors amid a storm of shot. Swinging his saber over the prostrate Confederates and uttering a terrific yell, he seized the flag and hastily returned to his lines. The 14th Tenn. carried 12 battle honors on its flag. The devotion to duty shown by Sgt. Maj. Hlncks gave encouragement to many of his comrades at a crucial moment of the battle. Rank and organization: Second Class Fireman, U.S. Navy. Born: 1841, Ireland. Accredited to: New York. G.O. No. : 45, 31 December 1864. Citation: Hinnegan served on board the U.S.S. Agawam, as one of a volunteer crew of powder boat which was exploded near Fort Fisher, 23 December 1864. The powder boat, towed in by the Wilderness to prevent detection by the enemy, cast off and slowly steamed to within 300 yards of the beach. After fuses and fires had been lit and a second anchor with short scope let go to assure the boat's tailing inshore, the crew again boarded the Wilderness and proceeded a distance of 12 miles from shore. Less than 2 hours later the explosion took place, and the following day fires were observed still burning at the forts. Rank and organization: Private, Company B, 47th Ohio Infantry. Place and date: At Vicksburg, Miss., 3 May 1863. Entered service at: Adrian, Mich. Born: 1841, Hillsdale, Mich. Date of issue: 13 December 1907. Citation: Was one of a party that volunteered and attempted to run the enemy's batteries with a steam tug and 2 barges loaded with subsistence stores. Rank and organization: Corporal, Company M, 2d Ohio Cavalry. Place and date: At Sailors Creek, Va., 6 April 1865. Entered service at: ------. Birth: Germany. Date of issue: 3 May 1865. Citation: Capture of flag. Rank and organization: Captain, Company A, 208th Pennsylvania Infantry. Place and date: At Petersburg, Va., 2 April 1865. Entered service at: ------. Birth: Perrysburg, Pa. Date of issue: 19 July 1895. Citation: Prevented a retreat of his regiment during the battle. Rank and organization: Corporal, Company A, 45th Pennsylvania Infantry. Place and date: Front of Petersburg, Va., 30 July 1864. Entered service at: Howard, Pa. Birth: Center County, Pa. Date of issue: 1 October 1864. Citation: Capture of flag of 6th Virginia Infantry (C.S.A.). Rank and organization: Private, Company D, 23d New York Infantry. Place and date: At Antietam, Md., 17 September 1862. At Fredericksburg, Va., 13 December 1862. Entered service at: ------. Birth: New York, N.Y. Date of issue: 22 June 1891. Citation: Distinguished gallantry in actions while attached to Battery B, 4th U.S. Artillery; lost his left arm at Fredericksburg. Rank and organization: Private, Company A, 41st Ohio Infantry. Place and date: At Brentwood Hills, Tenn., 16 December 1864. Entered service at: ------. Birth: Hartford, Ohio. Date of issue. 22 February 1865. Citation. Capture of Confederate guidon. Rank and organization. Private, Company B, 7th Massachusetts Infantry. Place and date: At Marye's Heights, Va., 3 May 1863. Entered service at: Fall River, Mass. Birth. England. Date of issue: 10 September 1897. Citation: With one companion voluntarily and with conspicuous daring advanced beyond his regiment, which had been broken In the assault, and halted beneath the crest. Following the example of these 2 men, the colors were brought to the summit, the regiment was advanced and the position held. Rank and organization: Corporal, Company D, 104th Illinois Infantry. Place and date: At Elk River, Tenn., 2 July 1863. Entered service at: La Salle County, Ill. Birth. Burlington, Ohio. Date of issue: 30 October 1897. Citation: Voluntarily joined a small party that, under a heavy fire, captured a stockade and saved the bridge. Rank and organization: Sergeant Major, 5th U.S. Colored Troops. Place and date: At Chapins Farm, Va., 29 September 1864. Entered service at: Athens, Ohio. Born: 1844, Austin, Tex. Date of issue: 6 April 1865. Citation: Took command of Company C, after all the officers had been killed or wounded, and gallantly led it. Rank and organization: Third Class Boy, U.S. Navy. Entered service at: New York. Birth: -----. G.O. No. : 1 I, 3 April 1863. Citation: Hollat served as third class boy on board the U.S.S. Varuna during an attack on Forts Jackson and St. Philip, 24 April 1862. He rendered gallant service through the perilous action and remained steadfast and courageous at his battle station despite extremely heavy fire and the ramming of the Varuna by the rebel ship Morgan, continuing his efforts until his ship, repeatedly holed and fatally damaged, was beached and sunk. Rank and organization: First Sergeant, Company H, 2d Minnesota Infantry. Place and date: At Nolensville, Tenn., 15 February 1863. Entered service at: Mankato, Minn. Birth: Cattaraugus County, N.Y. Date of issue: 11 September 1897. Citation: Was one of a detachment of 16 men who heroically defended a wagon train against the attack of 125 cavalry, repulsed the attack and saved the train. Rank and organization: Private, Company A, 3d Indiana Cavalry. Place and date: At Sailors Creek, Va., 6 April 1865. Entered service at: Indianapolis, Ind. Birth: Vermilion County, Ill. Date of issue: 3 May 1865. Citation: Capture of flag of 27th Virginia Infantry (C.S.A.). Rank and organization: First Sergeant, Company A, 7th Michigan Cavalry. Place and date: At Falling Waters, Va., 14 July 1863. Entered service at: Battle Creek, Mich. Born: 25 May 1838, Potter, N.Y. Date of issue: 21 March 1889. Citation: Capture of flag of 55th Virginia Infantry (C.S.A.). In the midst of the battle with foot soldiers he dismounted to capture the flag. Rank and organization: First Sergeant, Company I, 6th Vermont Infantry. Place and date: At Lees Mills, Va., 16 April 1862. Entered service at: Williston, Vt. Birth: Westminster, Vt. Date of issue: 9 July 1892. Citation: Rescued the colors of his regiment under heavy fire, the color bearer having been shot down while the troops were in retreat. Rank and organization: Color Sergeant, Company A, 29th Massachusetts Infantry. Place and date: Near Petersburg, Va., 30 July 1864. Entered service at:------. Birth: Roxbury, Mass. Date of issue: 3 June 1869. Citation: Fought his way through the enemy's lines with the regimental colors, the rest of the color guard being killed or captured. Rank and organization: First Lieutenant, Company E, 4th Vermont Infantry. Place and date: At South Mountain, Md., 14 September 1862. Entered service at: Boston, Mass. Birth: Salem, N.Y. Date of issue: 17 September 1891. Citation: Rode alone, in advance of his regiment, into the enemy's lines, and before his own men came up received the surrender of the major of a Confederate regiment, together with the colors and 116 men. Rank and organization: Corporal, Company L, 1st New Jersey Cavalry. Place and date: At Chamberlains Creek, Va., 31 March 1865. Entered service at:------. Birth: Willimantic, Conn. Date of issue: 3 July 1865. Citation: With the assistance of a comrade, headed off the advance of the enemy, shooting two of his color bearers; also posted himself between the enemy and the led horses of his own command, thus saving the herd from capture. Rank and organization: Corporal, Company I, 1st New Jersey Infantry. Place and date: At Gaines Mill, Va., 27 June 1862. Entered service at:------. Birth: Warren County, N.J. Date of issue: 9 July 1892. Citation: Voluntarily carried a wounded comrade, under heavy fire, to a place of safety; though twice wounded in the act, he continued in action until again severely wounded. Rank and organization. Sergeant, Company E, 72d New York Infantry. Place and date: At Gettysburg, Pa., 2 July 1863. Entered service at: Dunkirk, N.Y. Birth:------. Date of issue: 5 April 1898. Citation: In a charge of his regiment this soldier captured the regimental flag of the 8th Florlda Infantry (C.S.A.). Rank and organization: Captain, Company H, 11th Connecticut Infantry. Place and date: At Fort Harrison, Va., 29 September 1864. Entered service at: Winsted, Conn. Born: 3 March 1843, Ireland Date of issue: 19 November 1897. Citation: While acting as an aide and carrying an important message, was severely wounded and his horse killed but delivered the order and rejoined his general. Rank and organization. Drummer, Company G, 1st Kentucky Infantry. Place and date: At Corinth, Miss., 21 May 1862. Entered service at : ------. Birth: Campbell County, Ky. Date of issue: 17 August 1895. Citation: Saved the life of a wounded officer lying between the lines. Rank and organization: Gunner's Mate, U.S. Navy. Born: 1838, Massachusetts. Accredited to: Massachusetts. G.O. No. : 59, 22 June 1865. Citation: Served as gunner's mate on board the U.S.S. Montauk, 21 September 1864. During the night of 21 September, when fire was discovered in the magazine lightroom of the vessel, causing a panic and demoralizing the crew, Horton rushed into the cabin, obtained the magazine keys, sprang into the lightroom and began passing out combustibles, Including the box of signals in which the fire originated. Rank and organization: Seaman, U.S. Navy. Born: 1839, Bristol Mass. Accredited to: Massachusetts. G.O. No. : 59, 22 June 1865. Citation: Served on board the U.S.S. Rhode Island, which was engaged in saving the lives of the officers and crew of the Monitor, 30 December 1862. Participating in the hazardous task of rescuing the officers and crew of the sinking Monitor, Horton, after rescuing several of the men, became separated in a heavy gale with other members of the cutter that had set out from the Rhode Island and spent many hours in the small boat at the mercy of the weather and high seas until finally picked up by a schooner 50 miles east of Cape Hatteras. Rank and organization: Private, Company C, 107th Pennsylvania Infantry. Place and date: At Petersburg and Norfolk Railroad, Va., 19 August 1864. Entered service at: Philadelphia, Pa. Birth: Lehigh County, Pa. Date of issue: 2 February 1865. Citation: Captured flag belonging to a North Carolina regiment, and through a ruse led them into the arms of Federal troops. Rank and organization: Private, Company E, 8th Indiana Infantry. Place and date: At Cedar Creek, Va., 19 October 1864. Entered service at: Henry County, Ind. Birth: Henry County, Ind. Date of issue: 26 October 1864. Citation: Capture of flag. Rank and organization: Captain, Company L, 14th New York Artillery. Place and date: At Petersburg, Va., 30 July 1864; 25 March 1865. Entered service at: Ogdensburg, N.Y. Born: 30 April 1842, Macomb, St. Lawrence County, N.Y. Date of issue: 5 April 1898. Citation: In the Union assault at the Crater (30 July 1864), and in the Confederate assault repelled at Fort Haskell, displayed most conspicuous gallantry and repeatedly exposed himself voluntarily to great danger, was 3 times wounded, and suffered loss of a leg. Rank and organization: Ordinary Seaman, U.S. Navy. Born: 1843, Mobile, Ala. Accredited to: Alabama. G.O. No. : 45, 31 December 1864. Citation: Houghton served on board the U.S. Picket Boat No. 1 in action, 27 October 1864, against the Confederate ram Albemarle, which had resisted repeated attacks by our steamers and had kept a large force of vessels employed in watching her. The picket boat, equipped with a spar torpedo, succeeded in passing the enemy pickets within 20 yards without being discovered and then made for the Albemarle under a full head of steam. Immediately taken under fire by the ram, the small boat plunged on, jumped the log boom which encircled the target and exploded its torpedo under the port bow of the ram. The picket boat was destroyed by enemy fire and almost the entire crew taken prisoner or lost. Rank and organization: Private, Company D, 104th Illinois Infantry. Place and date: At Elk River, Tenn., 2 July 1863. Entered service at: Brookfield, Cook County, Ill. Birth: Canada. Date of issue: 27 March 1900. Citation: Voluntarily joined a small party that, under a heavy fire, captured a stockade and saved the bridge. Rank and organization: Commissary Sergeant, 1st West Virginia Cavalry. Place and date: At Sailors Creek, Va., 6 April 1865. Entered service at: ------. Birth: Clymer, N.Y. Date of issue: 3 May 1865. Citation: Capture of flag. Rank and organization: Corporal, Company B, 11th Pennsylvania Reserves. Place and date: At Glendale, Va., 30 June 1862. Entered service at: Indiana, Pa. Birth:------. Date of issue: 30 March 1898. Citation: While pursuing one of the enemy's sharpshooters, encountered 2 others, whom he bayoneted in hand-to-hand encounters; was 3 times wounded in action. Rank and organization:. Private, Company H, 11th Ohio Infantry Place and date. At Missionary Ridge, Tenn., 25 November 1863. Entered service at: Ohio. Born. 17 February 1843, Urbana, Ohio. Date of issue: 29 July 1892. Citation: Scaled the enemy's works and in a hand-to-hand fight helped capture the flag of the 18th Alabama Infantry (C.S.A.). Rank and organization: Sergeant, Company K, 158th New York Infantry. Place and date: At Battery Gregg, near Petersburg, Va., 2 April 1865. Entered service at:------. Birth: Newton, N.J. Date of issue: 12 May 1865. Citation: Carried the colors in advance of the line of battle, the flagstaff being shot off while he was planting it on the parapet of the fort. Rank and organization: Landsman, U.S. Navy. Born: 1843, Ireland. Accredited to: New York. G.O. No. : 45, 31 December 1864. Citation: Served on board the U.S.S. Tacony during the taking of Plymouth, N.C., 31 October 1864. Carrying out his duties faithfully during the capture of Plymouth, Howard distinguished himself by a display of coolness when he participated in landing and spiking a 9-inch gun while under a devastating fire from enemy musketry. Rank and organization: Brigadier General, U.S. Volunteers. Place and date: At Fair Oaks, Va., 1 June 1862. Entered service at: Maine. Born: 8 November 1830, Leeds, Maine. Date of issue: 29 March 1893. Citation: Led the 61st New York Infantry in a charge in which he was twice severely wounded in the right arm, necessitating amputation. Rank and organization: Boatswain's Mate, U.S. Navy. Born: 1829 France. Accredited to: Massachusetts. G.O. No. : 17, 10 July 1863. Citation: Served on board the U.S.S. Mississippi during the action against Port Hudson, 14 March 1863. Running aground during the darkness and in the midst of battle while exposed to a devastating fire from enemy shore batteries, the Mississippi was ordered abandoned after a long and desperate attempt to free her. Serving courageously throughout this period in which a steady fire was kept up against the enemy until the ship was enveloped in flames and abandoned. Howard acted gallantly in his duties as boatswain's mate. Soon after the firing of the Mississippi and its abandonment, it was seen to slide off the shoal, drift downstream and explode, leaving no possibility of its falling into enemy hands. Rank and organization: First Sergeant, Company H, 8th Vermont Infantry. Place and date: At Bayou Teche, La., 14 January 1863. Entered service at: Townshend, Vt. Birth: Jamaica, Vt. Date of issue: 29 January 1894. Citation: Voluntarily carried an important message through the heavy fire of the enemy to bring aid and save the gunboat Calhoun. Rank and organization: Musician, Company C, 55th Illinois Infantry. Place and date: At Vicksburg, Miss., 19 May 1863. Entered service at: Woken, Ill. Birth: Portage County, Ohio. Date of issue: 2 3 April 1896. Citation: A drummer boy, 14 years of age, and severely wounded and exposed to a heavy fire from the enemy, he persistently remained upon the field of battle until he had reported to Gen. W. T. Sherman the necessity of supplying cartridges for the use of troops under command of Colonel Malmborg. Rank and organization: Sergeant, Company K, 29th Massachusetts Infantry. Place and date: At Fort Stedman, Va., 25 March 1865. Entered service at:------. Birth: Haverhill, Mass. Date of issue: 8 March 1895. Citation: Served an abandoned gun under heavy fire. Rank and organization: Captain, Company A, 21st Connecticut Infantry. Place and date: At Fort Harrison, Va., 30 September 1864. Entered service at: North Stonington, Conn. Born: 19 April 1837, Wolcottville, Conn. Date of issue: 13 June 1894. Citation: Led out a small flanking party and by a clash and at great risk captured a large number of prisoners. Rank and organization: Private, Company C, 17th Indiana Mounted Infantry. Place and date: At Culloden, Ga., April 1865. Entered service at: La Porte County, Ind. Birth: Madison County, Ky. Date of issue: 17 June 1865. Citation: Capture of flag of Worrill Grays (C.S.A.). Rank and organization: Sergeant, U.S. Marine Corps. Born: 1834, Sligo County, Ireland. Accredited to: New York. G.O. No. : 45, 31 December 1864. Citation: On board the U.S.S. Brooklyn during action against rebel forts and gunboats and with the ram Tennessee in Mobile Bay, 5 August 1864. Despite severe damage to his ship and the loss of several men on board as enemy fire raked the decks, Sgt. Hudson fought his gun with skill and courage throughout the furious 2-hour battle which resulted in the surrender of the rebel ram Tennessee. Rank and organization: Corporal, Company C, 12th Kentucky Infantry. Place and date: At Weldon Railroad, Va., 24 June 1864. Entered service at: Albany, Ky. Born: 21 January 1841, Fentress County, Tenn. Date of issue: 1 August 1865. Citation: Capture of flag of 11th South Carolina (C.S.A.). Rank and organization: Corporal, Company L, 2d Ohio Cavalry. Place and date: At Sailors Creek, Va., 6 April 1865. Entered service at: ------. Birth: Highland, Ohio. Date of issue: 3 May 1865. Citation: Capture of flag of 38th Virginia Infantry (C.S.A.). Rank and organization: Lieutenant Colonel, 150th Pennsylvania Infantry. Place and date: At Gettysburg, Pa., 1 July 1863. Entered service at: Philadelphia, Pa. Born: 17 July 1839, Meadville, Pa. Date of issue: 27 May 1905. Citation: While engaged in repelling an attack of the enemy, received a severe wound of the right arm, but instead of retiring remained at the front in command of the regiment. Rank and organization: Private, Company H, 6th Missouri Infantry. Place and date: At Vicksburg, Miss., 22 May 1863. Entered service at: Jefferson County, Mo. Birth: Montgomery County, Ind. Date of issue: 12 July 1894. Citation: Gallantry in the charge of the "volunteer storming party." Rank and organization: Sergeant, Company E, 34th Massachusetts Infantry. Place and date: At Petersburg, Va., 2 April 1865. Entered service at: Spencer, Mass. Birth: Spencer, Mass. Date of issue: 12 May 1865. Citation: In the assault on Fort Gregg, bore the regimental flag bravely and was among the foremost to enter the work. Rank and organization: Private, Company B, 3d Pennsylvania Cavalry. Place and date: On the Peninsula, Va., 5 June 1862. Entered service at: Philadelphia, Pa. Birth: Philadelphia, Pa. Date of issue: 2 August 1897. Citation: While under fire, between the lines of the 2 armies, voluntarily gave up his own horse to an engineer officer whom he was accompanying on a reconnaissance and whose horse had been killed, thus enabling the officer to escape with valuable papers in his possession. Rank and organization: Fireman, U.S. Navy. Born: 1841, New York, N.Y. Accredited to: New York. G.O. No. : 32, 16 April 1864. Citation: Fireman on board the U.S.S. Carondelet, Deer Creek Expedition, March 1863. Carrying out his duties gallantly, Huskey volunteered to aid in the rescue of the tug Ivy under the fire of the enemy, and set forth general meritorious conduct during this hazardous mission. Rank and organization: First Sergeant, Company D, 127th Illinois Infantry. Place and date: At Vicksburg, Miss., 22 May 1863. Entered service at: Gardner, Ill. Birth: Pennsylvania, Date of issue: 9 July 1894. Citation: Gallantry in the charge of the "volunteer storming party." Rank and organization: Major, 7th Maine Infantry. Place and date: At Antietam, Md., 17 September 1862. Entered service at: Bath, Maine. Birth: Italy. Date of issue: 8 April 1891. Citation: Led his regiment in an assault on a strong body of the enemy's infantry and kept up the fight until the greater part of his men had been killed or wounded, bringing the remainder safely out of the fight. Rank and organization: Seaman, U.S. Navy. Born: 1819, Ireland. Accredited to: Illinois. G.O. No. : 45, 31 December 1864. Citation: Served as seaman on board the U.S.S. Signal which was attacked by field batteries and sharpshooters and destroyed in Red River, 5 May 1864. Proceeding up the Red River, the U.S.S. Signal engaged a large force of enemy field batteries and sharpshooters, returning their fire until the ship was totally disabled, at which time the white flag was raised. Although wounded, Hyland courageously went in full view of several hundred sharpshooters and let go the anchor, and again to slip the cable, when he was again wounded by the raking enemy fire. Rank and organization: Captain, Company D, 115th Illinois Infantry. Place and date: At Buzzard's Roost Gap, Ga., 13 October 1864. Entered service at: Rushville, Schuyler County, Ill. Born: 17 May 1829, Harrison County, Ind. Date of issue: 28 March 1896. Citation: With only 41 men under his command, defended and held a blockhouse against the attack of Hood's Division for nearly 10 hours, thus checking the advance of the enemy and insuring the safety of the balance of the regiment, as well as that of the 8th Kentucky Infantry, then stationed at Ringgold, Ga.
Rank and organization: Sergeant, Company E, 207th Pennsylvania Infantry. Place and date: At Fort Sedgwick, Va., 2 April 1865. Entered service at: Pennsylvania. Birth: York County, Pa. Date of issue: Unknown. Citation: The color bearer falling, pierced by 7 balls, he immediately sprang forward and grasped the colors, planting them upon the enemy's forts amid a murderous fire of grape, canister, and musketry from the enemy. Rank and organization: Corporal, Company F, 2d U.S. Artillery. Place and date: At Wilsons Creek, Mo., 10 August 1861. Entered service at: ------. Birth: Ross, Ohio. Date of issue: 19 July 1890. Citation: Bravery in action. Rank and organization: Private, Company K, 8th Vermont Infantry. Place and date: At Boutte Station, La., 4 September 1862. Entered service an Belvidere, Vt. Birth: Boston, Mass. Date of issue: 20 October 1899. Citation: A railroad train guarded by about 60 men on flat cars having been sidetracked by a misplaced switch into an ambuscade of guerrillas who were rapidly shooting down the unprotected guards, this soldier, under a severe fire in which he was wounded, ran to another switch and, opening it, enabled the train and the surviving guards to escape. Rank and organization: Corporal, Company E, 12th Ohio Infantry. Place and date: At South Mountain, Md., 14 September 1862. Entered service at: Charleston, W. Va. Birth: Chatham, Ohio. Date of issue: 31 January 1894. Citation: Alone and unaided and with his left hand disabled, captured a Confederate captain and 4 men. Rank and organization: Seaman, U.S. Navy. Born: 1840, England. Accredited to: New York. G.O. No. : 45, 31 December 1864. Citation: Stationed at the wheel on board the U.S.S. Brooklyn during action against rebel forts and gunboats and with the ram Tennessee in Mobile Bay, 5 August 1864. When heavy enemy fire struck down several men at their guns and replacements were not available, Irlam voluntarily released 2 men who were stationed with him and carried on at the wheel with the assistance of only one of the crew throughout the furious battle. Rank and organization: Captain, Company D, 45th New York Infantry. Place and date: At Gettysburg, Pa., 1 July 1863. Entered service at: New York, N.Y. Birth:------. Date of issue: 27 May 1892. Citation: Gallantry in flanking the enemy and capturing a number of prisoners and in holding a part of the town against heavy odds while the Army was rallying on Cemetery Hill. Rank and organization: Coxswain, U.S. Navy. Born: 1839, East Brooklyn, N.Y. Accredited to: New York. G.O. No. : 45, 31 December 1864. Citation: On board the U.S.S. Brooklyn during action against rebel forts and gunboats and with the ram Tennessee, in Mobile Bay, 5 August 1864. Despite severe damage to his ship and the loss of several men on board as enemy fire raked her decks from stem to stern, Irving fought his gun with skill and courage throughout the furious battle which resulted in the surrender of the prize rebel ram Tennessee and in the damaging and destruction of batteries at Fort Morgan. Rank and organization: Coxswain, U.S. Navy. Born: 1842, England. Accredited to: New York. G.O. No. : 32, 16 April 1864. Citation: Served on board the U.S.S. Lehigh, Charleston Harbor, 16 November 1863, during the hazardous task of freeing the Lehigh, which had grounded, and was under heavy enemy fire from Fort Moultrie. Rowing the small boat which was used in the hazardous task of transferring hawsers from the Lehigh to the Nahant. Irving twice succeeded in making the trip, while under severe fire from the enemy, only to find that each had been in vain when the hawsers were cut by hostile fire and chaffing. Rank and organization: Seaman, U.S. Navy. Born: 1833, Denmark. Accredited to: New York. G.O. No. : 45, 31 December 1864. Citation: On board the U.S.S. Brooklyn during action against rebel forts and gunboats and with the ram Tennessee, in Mobile Bay, 5 August 1864. Despite severe damage to his ship and the loss of several men on board as enemy fire raked her decks from stem to stern, Irwin fought his gun with skill and courage throughout the furious battle which resulted in the surrender of the prize rebel ram Tennessee and in the damaging and destruction of batteries at Fort Morgan. Rank and organization: First Sergeant, Company H, 14th Michigan Infantry. Place and date: At Jonesboro, Ga., 1 September 1864. Entered service at: Ann Arbor, Mich. Born: 1839, Ireland. Date of issue: 28 April 1896. Citation: In a charge by the 14th Michigan Infantry against the entrenched enemy was the first man over the line of works of the enemy, and demanded and received the surrender of Confederate Gen. Daviel Govan and his command. Last Names starting with "H" and "I"